It's official. Intel has secretly agreed to buy over beleaguered NVIDIA! The ink is still wet and there is still much to work out before NVIDIA becomes part of Intel, but it is a done deal according to an inside source. The press offices of both Intel and NVIDIA strenously denied this, of course. The graphics chip design company has been at the forefront of 3D graphics technology until recently, when a combination of a technical slump and a global recession hit it hard. Sales were so bad they had to rebrand one of their older graphics cards as a new model. They were also hit badly by problems with their mobile GPUs, which irked not only their users but also their OEM partners. It was a remarkably rapid reversal of fortunes for NVIDIA. With several key design successes, NVIDIA rapidly went from an obscure company to arguably the leading 3D graphics processor company in the world. Right before their fall from grace, the company boasted a retail market share of over 80%. For a long while, it appeared that they could do no wrong. In fact, the company was so supremely confident of their success that they even took on CPU behemoth, Intel. Their company president and CEO, Huang Jen-Hsun, openly belittled Intel's upcoming Larrabee processor, claiming that it was nothing more than "a PowerPoint slide". Ironically, it is Intel and the Larrabee processor that will be NVIDIA's salvation. The Larrabee is Intel's next generation processor microarchitecture. It is a many-core x86 architecture designed to address what was grossly lacking in the remarkable Intel arsenal of products - credible 3D graphics processing capability. Through Larrabee, Intel is attempting to do (in reverse) what NVIDIA and ATI were attempting to do with their General Purpose GPU (GPGPU) initiative. Larrabee is Intel's attempt at making a CPU that is more like a GPU. Although a single Larrabee processor core is hardly powerful enough to match the graphics processing capability of modern GPUs, Intel intends to use large numbers of these Larrabee cores to match or even exceed the performance of dedicated GPUs. 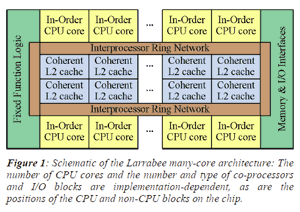 For more information on Larrabee, take a look at the Intel Larrabee Processor Tech Report. • Where Does NVIDIA Come In? • What About The Larrabee Cores? • How Fast Is The Graphics Co-Processor? • So What Happens To NVIDIA? How Fast Is The 512 GB PCIe X4 SSD In The 2015 MacBook Pro?